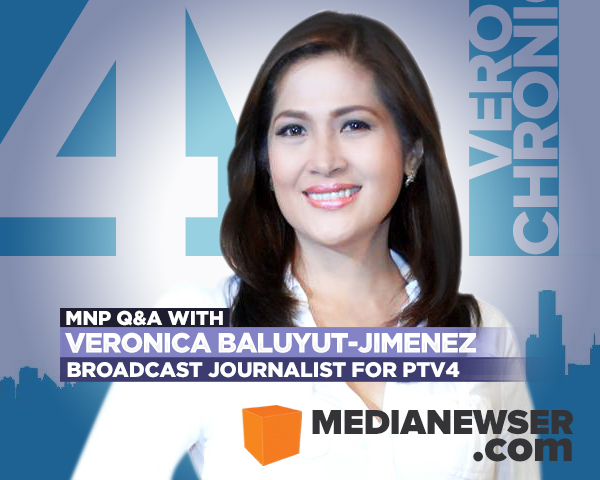 From her earliest days as a GMA-7 newser to becoming one of the pillars of PTV4, Veronica Baluyut-Jimenez has always been dedicated to journalism. A homegrown talent of GMA News, Baluyut-Jimenez was a familiar face to televiewers in the '80s and '90s as anchor of GMA Balita and GMA News Live, while appearing as a reporter for other GMA-7 newscasts. Now marking her 30th year in the business, Baluyut-Jimenez currently serves as vice chairman of the board of PTV4, while hosting shows like Bridging Borders, Kwatrobersyal, and the top-rating investigative program The Veronica Chronicles — a passion project for the veteran journalist herself. "It took a while for me to convince the PTV4 executives to agree to have the show considering its nature," she says. "My objective was to tackle issues that affect Filipinos and show the various perspectives of the stakeholders." In this MNP Q&A, Baluyut-Jimenez talks about her storied career as a journalist, her rise to the top, and her experience working on GMA News. Be sure to be part of the discussion by tweeting us @medianewserphil or posting your comments below or on our Facebook page. Tell our readers your story. Who is Veronica Baluyut-Jimenez both on-cam and off-cam? On cam, I am the program host of the investigative documentary The Veronica Chronicles, the talk show Kwatrobersyal, and the travelogue/diplomatic show Bridging Borders. Being the program host, I do all the spiels, voice-overs and interviews of resource persons. I also write the episodes of Bridging Borders. Off cam I am the Vice Chairman of the Board of People’s Television Network. The Board of PTV is very hands on in the operations of the network so aside from our twice a month board meetings, we are also busy with the many other needs of the station. I am also a wife and a mother of five children. What made you want to get into the broadcast news industry? I find the broadcast news industry very exciting. There’s always something new everyday and people in the news industry are always the first to know what is happening in the country and all over the world. What or who motivates you all these years? My thirst to always learn something new and to constantly strive towards being the best that I can be motivates me. Being able to achieve things that I never thought I could and being able to make a difference in the lives of people inspire me and make me get up every morning looking forward to going to work. But most of all, I suppose, is the thought that I was given the grace and responsibility to be in media and so I must fulfill my job well as I owe it to our viewers and to our Maker who gave the talents to be where I am today. You started your career at GMA News back in the mid-'80s. Tell us about your experience working there. I started in GMA-7 in the mid-1980’s as a news reporter and news anchor. I also did the hourly newscasts in GMA-7’s radio stations DWLS and DZBB. Being a junior reporter, I was given the general beat including the coverage of fires in the metropolis. It was literally a baptism of fire for me. I went to cover a house that burned down and was shocked to see the burnt body of a victim that reminded me of crispy pata. It was then that I learned that as a reporter, you must know how to be detached from your stories and not make them affect you too much. One of my early assignments was to do a story on the murders of actress/host Elvira Manahan and her house help. I went to her house where the massacre just occurred. We were allowed inside the house. There was blood all over although the bodies were already taken to the hospital. I had to wait with my cameraman inside the house for the police to arrive so that I could get my interview. This coverage left me shaken for a while as the images of the victims remained in my mind even as I tried to sleep that night. What can you consider the highlights of your time there? One of the highlights of my time in GMA-7 was when I was doing the Malacañang Beat covering President Cory Aquino. I became the President of the Malacañang Press Corps and I had the opportunity to cover several of her state and official visits to North America, Europe and Asia. You will recall that during her presidency, a number of coup attempts were made against her. During one of the coup attempts, we received intelligence reports that they were going to bomb Malacañang so the Press Corps was asked to run to the nearby San Miguel Church to seek shelter. From Kalayaan hall in Malacañang, we reporters and cameramen hurried to the church and waited 'till it was safe to leave. A Tora Tora plane dropped a bomb in Malacañang but it landed short of the main building, and thankfully, no one was hurt. Are you still in contact with your GMA Newser friends? Yes, I am still in contact with many of my GMA newser friends. We try to see each other when we can. "Being able to achieve things that I never thought I could and being able to make a difference in the lives of people inspire me and make me get up every morning looking forward to going to work." What are some of the valuable lessons, be it in life or career, that you have learned from your 15-year run there? I learned a lot of valuable lessons in my stint in GMA-7. First, the only real way to succeed is hard work and discipline. I learned to live and breathe the news day in and day out. I was constantly monitoring not only TV news, but radio and print news as well. At that time, there was still no social media. Being in the news, we had no holidays nor weekends. We were on call 24/7. I remember distinctly my boss, Mr. Antonio Seva, stressing to me when I started that I can only be absent from work if I’m sick to the point of dying. Otherwise, there is no other excuse for being absent. 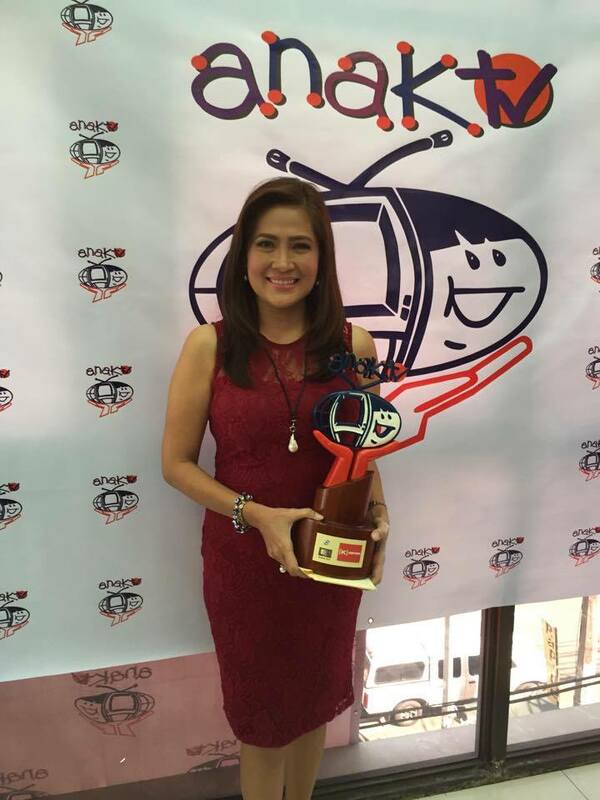 It was in GMA-7 that I learned to persevere and endure despite all the challenges and competition. Was it difficult for you to leave the network where you basically learned the ropes and rules of broadcast news? I loved my work and the network where I learned all the ropes in broadcasting. However, it took most of my time. Christmas and New Year’s Day were spent at work. I would have to be at the station at 8 o’clock in the morning to do my coverage and I would go home after midnight because I had to do a live report for the late evening newscast. I realized that I was missing out on the growing years of my children. I was three months on the way with our fifth child and was having a terrible bout of morning sickness. I’ve always had difficult pregnancies with threats of miscarriage. (My first pregnancy resulted in a miscarriage when I was covering Malacañang running after cabinet secretaries for ambush interviews in my high heels unaware that I was pregnant.) But it was the day when the judge would give out her decision on the Vizconde massacre and I was assigned to cover it. I was torn between going to work and just resting at home. It was at that point that I told myself that family should come first. Tell us about Advertising Ventures Inc. What was your experience with that company like? I was away from TV broadcasting for a few years and worked for the family business that dealt with non-traditional media advertising. I headed the sales and marketing department. It was a great learning experience for me. I met people from the marketing and advertising industry and some of them became very close friends. I discovered talents that I didn’t know I had and my creativity was honed. What do you think are some of the relevant skills that you acquired from working in the advertising industry that made you a much stronger journalist? I learned how to strategize and think out of the box to beat the competition and to be able to maintain big clients. We held focus group discussions in the provinces for our clients targeting the grassroots and this somehow brought out the journalist in me. 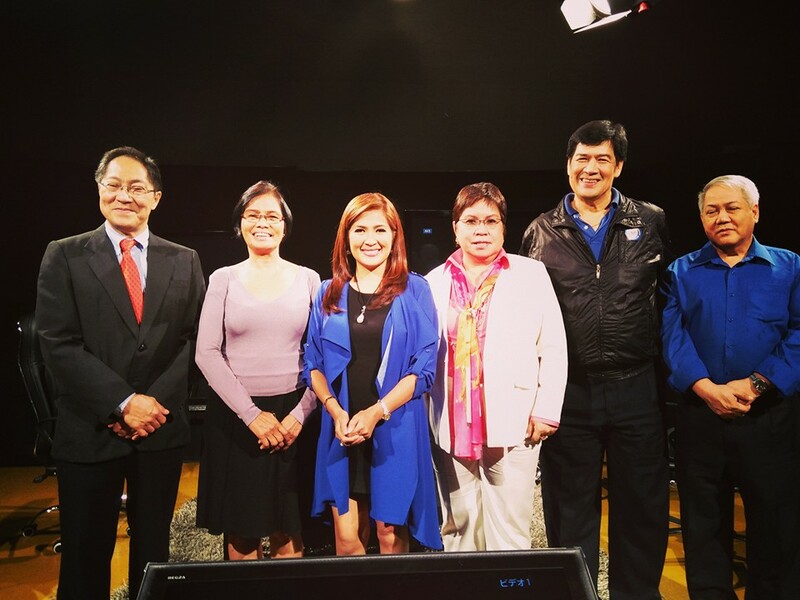 Five years after you took a break from broadcast news, you joined PTV4. Tell us about the transition. In the year 2005, I was offered to host for Radio TV Malacañang for the Presidential coverages. The required work hours were not as bad as when I was working for GMA-7, and I had missed being in broadcasting so I took the offer. I was also given a morning show on PTV4. The transition wasn’t too difficult as I had been trained for years to annotate and do interviews. I had a lot of fun doing The Morning Show and One Morning as it was a mix of news and lifestyle. Tell us about your show The Veronica Chronicles. The Veronica Chronicles is the very first one-hour investigative show on the government network. It took a while for me to convince the PTV4 executives to agree to have the show considering its nature. My objective was to tackle issues that affect Filipinos and show the various perspectives of the stakeholders. Possible solutions are presented to alert and encourage government agencies concerned to act on the problem. Your show is very active in social media. Tell us about your team's social media strategy in targeting new and potential eyeballs. Also, do you think it really helps in promoting your program? Social media is a very powerful tool in reaching potential viewers. We know that the other big networks are using the strategy of tying up their programs to social media to increase their ratings, that is why during the airing of our news and public affairs shows, our various teams are very active on Facebook, Twitter, Instagram and other social networking sites. I think this has a big impact on the ratings of our programs. 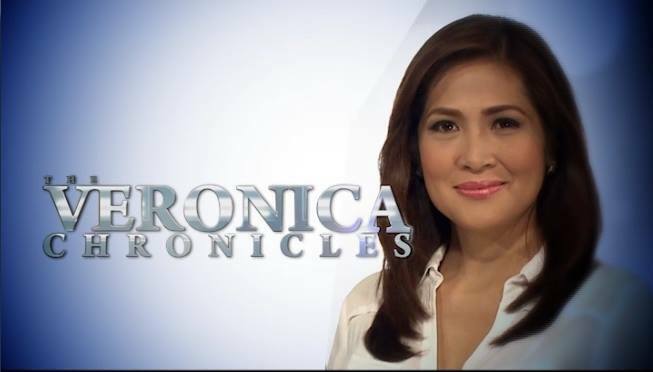 Right now, The Veronica Chronicles is one of the highest rating programs in PTV4. So far, what would be the most unforgettable broadcast/episode for you and why? I can think of many TVC episodes that are truly unforgettable for me. But one of the ones that easily come to mind is the episode “Pagkagat ng Dilim." It is a story about an exorcist and the demonic possession of several victims whom I interviewed after they have been exorcised. It made me realize that the devil is real and a spiritual battle is actually happening in our midst. While we were doing the story, my executive producer and I were experiencing oppressions we had never encountered before in our other episodes. I must admit that I went through a paradigm shift after the episode. And your most unforgettable guests? I had interviewed presidents, prime ministers, cabinet secretaries and other famous people but my most unforgettable interviewee was a 7-year old girl named Ashley. She is a frail-looking little girl covered in bandages and very small for her age. She had stage 4 bone marrow cancer and afflicted with a skin disease called epidermolysis bullosa. Every time she is given a bath, she wails from the excruciating pain as the water touches her skin. Despite all the pain that she suffers, her will to live is admirable. TVC facilitated her seeing Pope Francis when he said mass at the Quirino Grandstand after learning that it was Ashley’s fervent prayer and belief that seeing the Pope will heal her. Nine months after she saw the Pope, we learned that her cancer had gone down to stage two and the doctors are optimistic that she is on her way to recovery. "As a government network, our objective is to be able to provide news, information and public service to inspire our viewers to be a part in nation building." I research and read everything about the topic before I do the interview. I also try to learn something about the interviewee. I want the interview to have a very fresh approach and to be very interesting in order to ensure that the viewers stay glued to it. How do you see your post at PTV4 developing in the near future? Right now, I am Vice Chairman of the Board of the Network. We have a working board that meets every so often in our quest to improve our programming, operations and reach as well as prepare for the forthcoming digitization of the network. We are also busy preparing for the reorganization of the network as part of its revitalization under its new charter. What do you think the network should do more to reach more viewers? The broadcasting industry today has become very competitive, fast paced and ever changing. Back when I was just starting, there were only five local channels. Now, I can hardly keep track of how many local and foreign channels we have. The industry has become global and continues to evolve every day. That is why it is imperative for us running the network to ensure that despite limited resources, we are able to keep up with the new trends in the industry both technically and in the creative aspect. As a government network, our objective is to be able to provide news, information and public service to inspire our viewers to be a part in nation building. What do you consider your biggest success both in your personal and professional life? I consider one of the biggest successes in my life is having a large, happy, healthy and normal family. Being able to enjoy my work with a passion and at the same time achieving a balanced family and spiritual life is a tough challenge but with God’s grace I am fortunate enough to have it all. Finally, what would be your advice to those who might want to join the industry? My best advice for those wanting to join the industry is to make sure that your interest truly lies here. It isn’t all glamour, fame or fortune. It is actually mostly hard work and a lot of challenges. It needs a lot of sacrifice and passion. But it is very fulfilling if you are passionate about it.